115 ton represents the tonnage power capacity of punching side. They are made of seperately dual piston and double pedal models which equipped with a total of 5 workstations. An electric motor that produces 11KW power is used on the machine. This power supplied from this motor transferred to the area of the piston on the body by means of the hydraulic oil and the tubes. No. 5 workstation is a notching section. No. 4 workstation is flat bar cutting section. No. 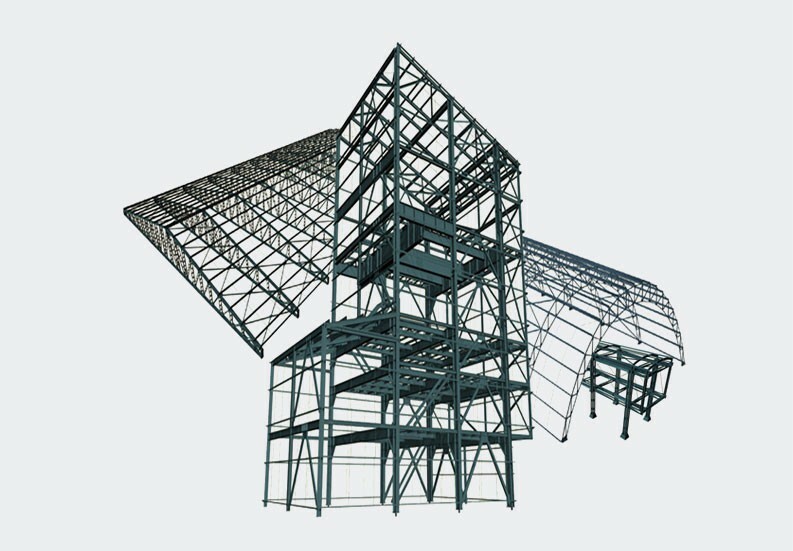 3 workstation Round- square steel bars can be cut, No. 2 workstation for cutting Angle bars in 45 and 90 degrees . 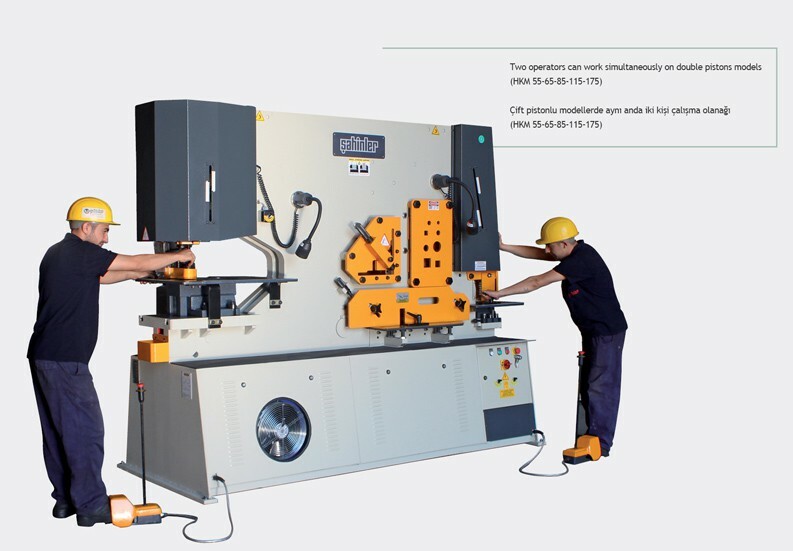 All of these workstations are under the control of a single pedal and movement of all these 4 workstations are provided with this pedal.In addition, a certain degree of V bending operation procedure can be performed with a pressbrake tool to be placed in the station. 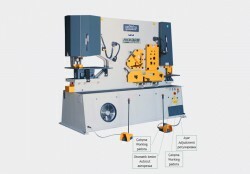 The stroke of the pistons can be adjusted according to the thickness of the desired material to be cut. 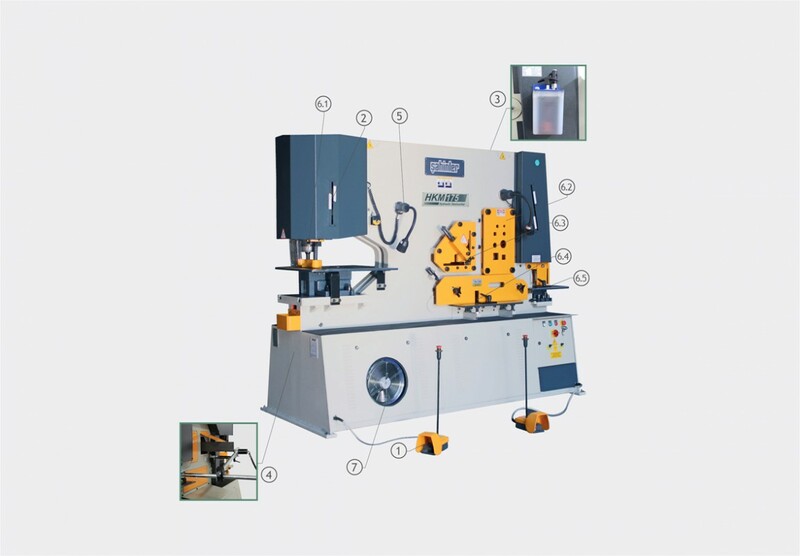 Once shifting the button over the electric panel to “Stroke Adjustment” it can be set to the desired operation height by pressing the foot pedal and then the fixing is done in the upper part of machine body by means of stroke switch. Moreover, in order to assist in the cutting process has improved automatic backgauge as standard . It is being activated with a button on the electric panel. When backgauge property is on than it comes pedal usage off and when profile or bar reaches to sensor it is being cut automaticaly.